Last modified on February 3rd, 2017 by Vincy. In this tutorial, we are going to see how to do AJAX add/edit operations by showing jQuery modal form. In a previous tutorial, we have seen PHP crud using jQuery AJAX. 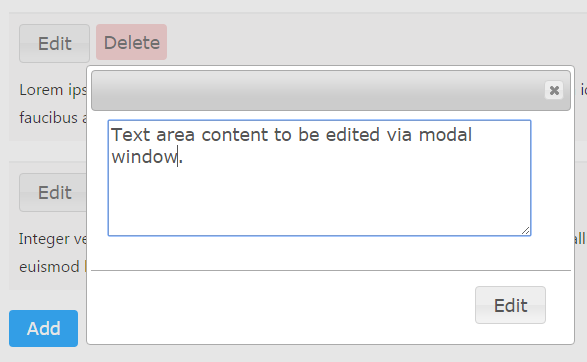 In this example, we are displaying add and edit forms in a modal dialog. After performing Add/Edit, the form will be closed automatically. The modal form includes a close icon to cancel operations. This script defines add and edit modal window properties. On submitting the modal form, it calls jQuery AJAX code to execute queries using PHP. In a previous tutorial, we have shown jQuery popup by using thickbox.